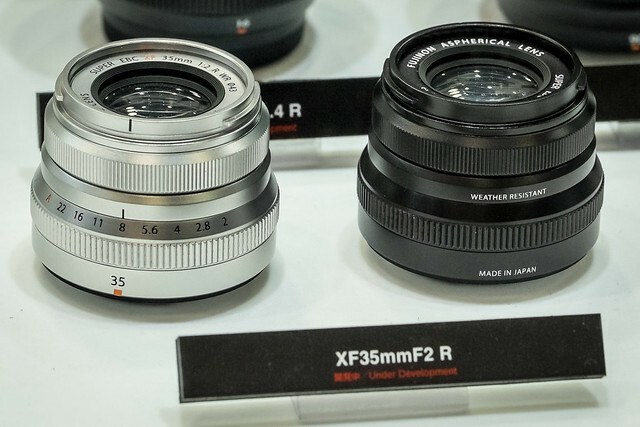 For anything non-Fujifilm related at CP+ 2015, jump here. 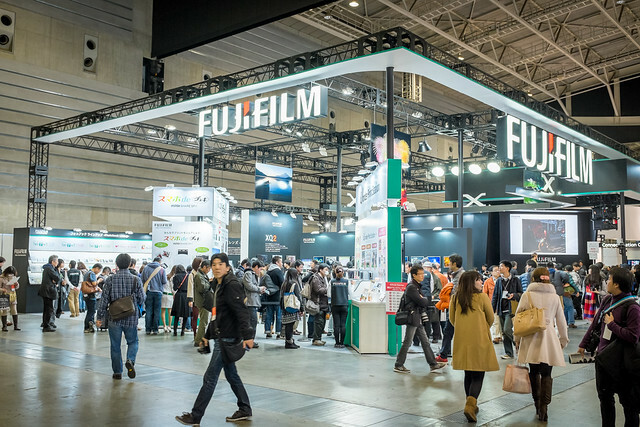 CP+ is always an exciting time for Fujifilm users, as we usually get a pick to some of the upcoming X-series products, way before they hit the market. Granted, this is mainly work-in-progress, so there might be changes down the road (such as the infamous “no-OIS on the final version of the XF16-55mmF2.8” incident), but still the refreshed lens roadmap always gives a welcome clarity on the big picture (no pun intended!). 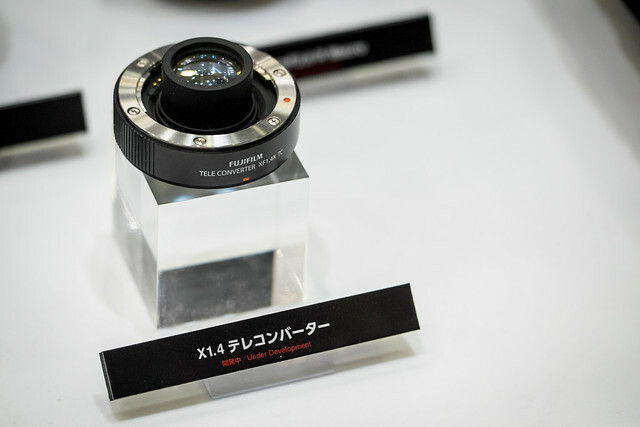 To me, and the long queue of people waiting for their turn, the highlight of Fujifilm’s stand at each CP+ is always the lens bar, where you can choose any XF lens that has already been officially released (so up to the XF16-55mmF2.8 this year), and try it on the X-series body of your choice. You can also try the X100’s line or Fuji’s compact cameras, if that is what you are interested in. 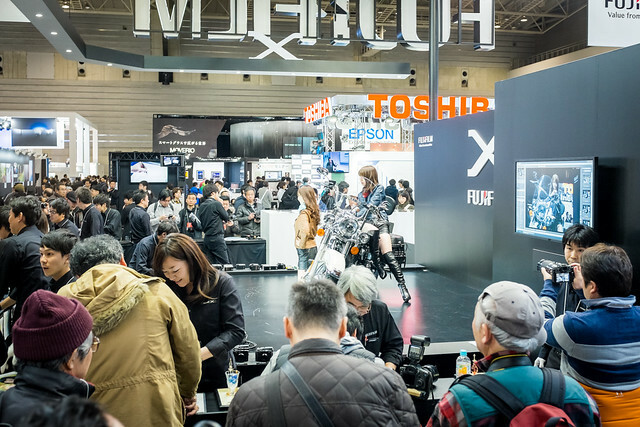 This year, Fujifilm had set up a stage with a Harley Davidson and a 2 models wearing high boots and tiny leather shorts posing around it. I want to make 2 quick comments about it. The first one is that, right off the bat, this setup is awkward, if not creepy. You can argue that it is some sort of tradition in such show floors, and especially so in Japan, but still, with a little bit of thoughts there are better things to do in terms of concept, makeup and wardrobe than planting a big motorbike as a prop and a couple girls in tiny shorts around it. 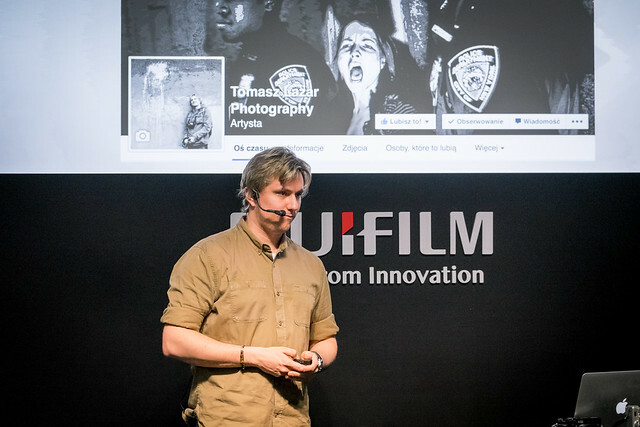 That’s the kind of setup you expect from companies who might have a good product but lack notoriety or marketing budget, but with Fujifilm we are used to a bit more of delicacy, if not intimacy, when it comes down to photography. I hope they pull out a better stage than that next year, and I’d be more than happy to contribute if they were to ask me. The second point is a general points regarding most of the booths on the show floor. You get all those companies who spend an incredible amount of money to build an environment in which prospected buyers can test their products, in order to make them want to buy these products. Then why don’t they take the time to properly lit the stage properly from a photographic point-of-view? If you let people take well lit pictures, they are more likely to take test pictures that will make them want to buy your products. Lighting is important for photographers, so if you want to talk to them give them a well lit test situation. 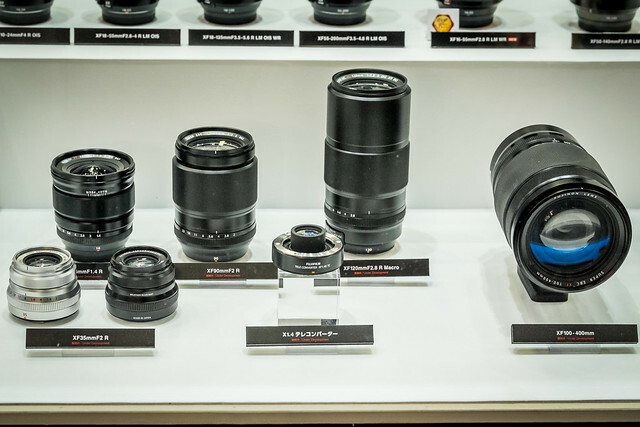 Some companies seem to get it more than others, hence Hasselblad going all the way as pairing with Profoto on their stand, so that when they demonstrate their more than $10k cameras they don’t do it with pictures that only get people go “blah”. 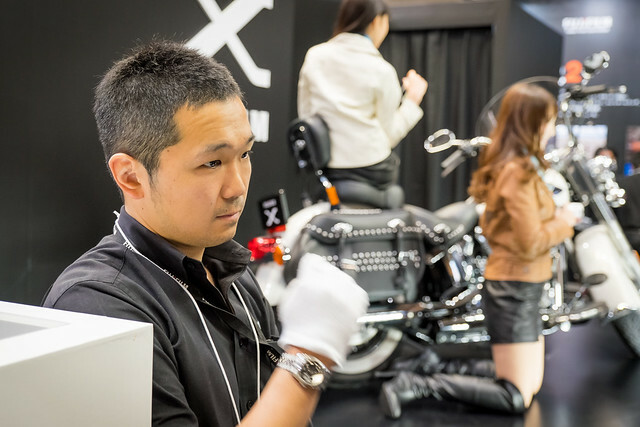 As I was saying before I derailed into a long segway, for me the main feature of Fuji’s stand at CP+ is the lens bar, so that’s where I headed into first. Since I had my own X-T1 with me, I could test all the lenses I wanted directly on my own body, which is awesome because that way you don’t have to lose 5min unwinding all the “automatic” settings they put by default on the test models. 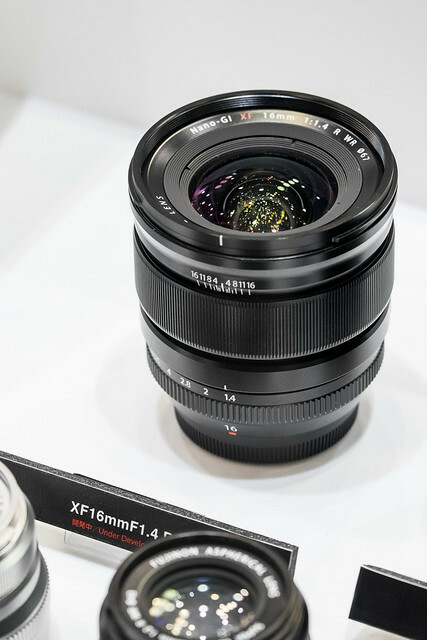 My first choice went to the just released XF16-55mmF2.8, which was the main reason I travelled to the exhibition center to begin with. 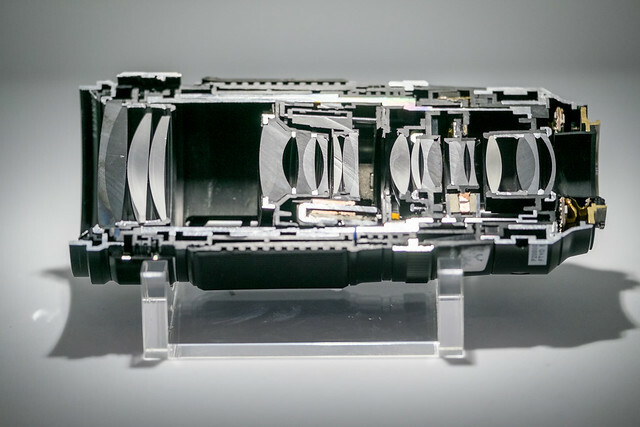 This lens is well balanced on the X-T1 (with battery grip) and operates smoothly and quickly. The aperture ring clicks nicely as well. I still don’t understand why there is no OIS for “image quality” purpose, as any lens will give you a better image quality than a blurry image or an image in which you have to crank up the ISO like crazy… But it is what it is, so let’s move on. I also took this opportunity to test the APD version of the XF56mm prime versus the standard version (which I own). Up until now, I had been completely underwhelmed by the comparisons I could find on the web between then2 lenses, as I could barely notice any difference. But looking at it directly on real samples, the difference is actually more obvious. You can clearly see that the bokeh on the APD version is “creamier”, while the standard version is rougher and more contrasty (something I have been complaining about in recent reviews). I am not sure if the APD version should cost twice as much as the standard version, but given the choice between the 2 lenses without any budget constraint I’d go with the APD version any day (unfortunately I do have budget constraints *sigh*…). 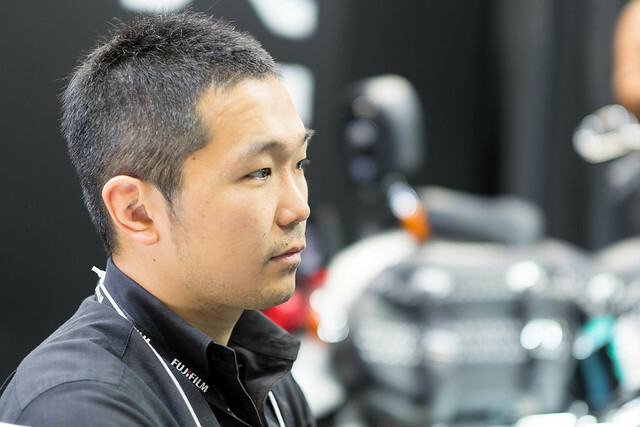 I tested a few others of the older lenses just for my pleasure, and then explored the other areas of the booth. The most exciting part there for curious X-photographers was the new lens roadmap. 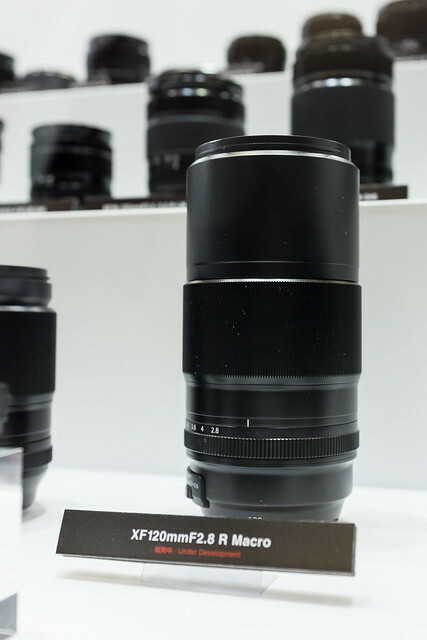 As usual, Fujifilm was presenting mockups of the upcoming lenses on the roadmap. 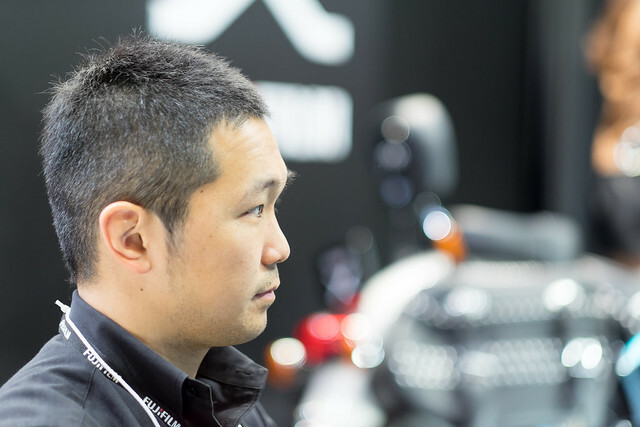 In the very near future, we should get the announcement of 2 prime lenses: the XF16mmF1.4 and the XF90mmF2. 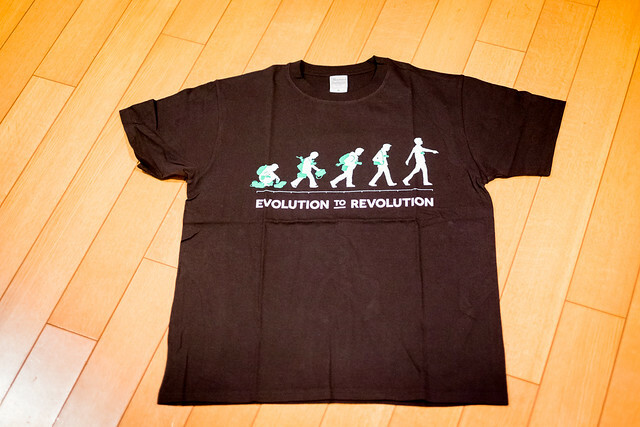 Much to my surprise, the design of the latter has completely changed compared to what I had seen just a few months ago. 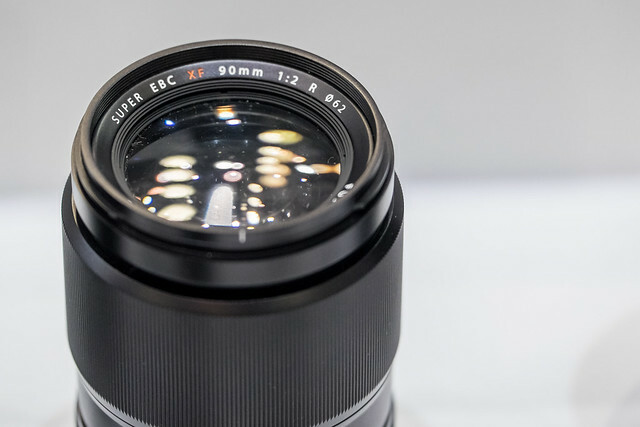 The diameter of the lens has been reduced, while the length significantly increased (the previous version looked more like a fat cousin of XF56mmF1.2). The filter tread size decreased to 62mm from 72mm on the earlier prototypes. 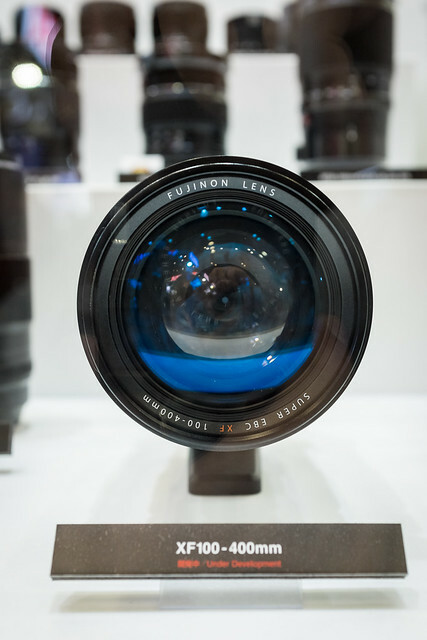 I have a feeling they could have made a faster prime with the initial design, though the lens was fatter and probably heavier, and I wished that’s what they had done (an XF90mmF1.2 for example). I’m only speculating though. In 2016, we are now set to get the long awaited supertelephoto zoom, and a 120mm F2.8 macro lens. Just like for the 90mm prime, the design of the “supertelephoto zoom” has been completely revamped. The lens is now slimmer but longer. The focal length has changed as well, and the lens will now cover the 100-400mm lens. 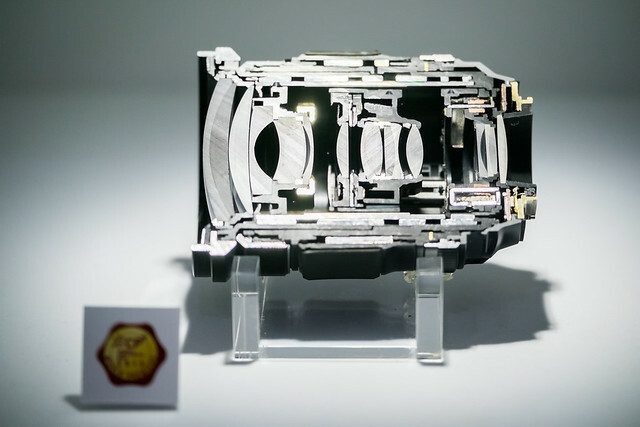 The maximum aperture is not yet final (well, the lens is still more than a year away, so nothing is really final at this stage), and in fact there was no mention of it on the ring around the front element of the prototype that was displayed. Note that there is no mention of the filter thread diameter as well, so that’s subject to change too. As a reminder, the previously exposed prototype was a 140-400mm F4-5.6 zoom, with an 86mm filter thread. 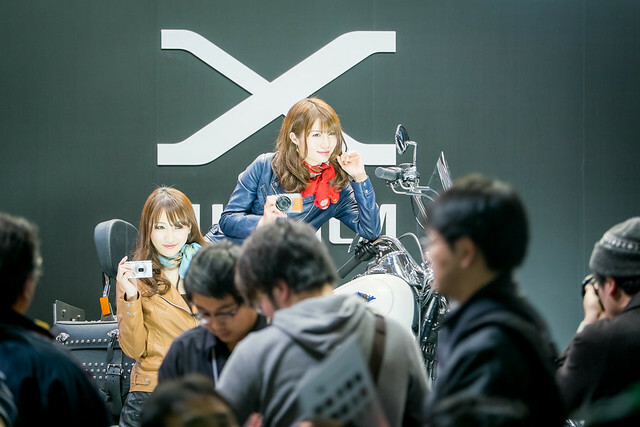 Beyond the X-Series cameras, Fujifilm is very popular (at least in Japan) for its instant cameras (Hello Kitty version anyone?) and its printing stations (the big ones you find in the chains selling electronic products). 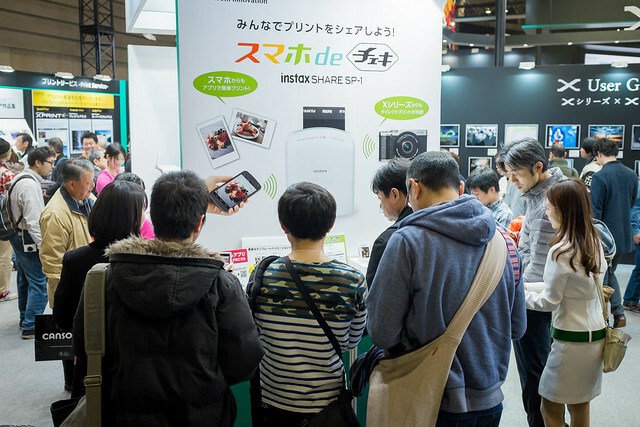 The small Instax printer was one of the main attractions on that side of the booth, as anyone was invited to download Instax app and bring home a print from their phone, in order to demonstrate how easy the whole process is.